INUA is a grass-roots project based in the Favela União de Vila Nova, in the East Zone of São Paulo, Brazil. Its mission is to promote community development through art, culture, environmental education and generation of paid work. 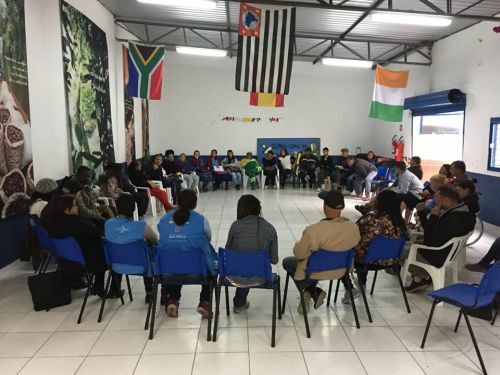 The Viveiro Escola project acts as a testament to INUA’s aptitude for transformation: at the center of the favela, residents have turned an abandoned waste heap into a thriving agro-ecological forest cared for by local women farmers. As well as many other activities, INUA also teaches art and culture courses to young people, while helping them develop leadership skills. The Bodega project is being developed to act as a community space for knowledge exchange, where the residents of the favela take centre stage as the protagonists of their own regeneration process. INUA draws on the resources of the favela itself to fuel regeneration. This challenges the view that the favelas depend on outside help to develop. Instead, it demonstrates that they can act as a needed source of nutrients for regenerating what is unhealthy about the entire city.